Queensland's transport network must be resilient to disruptions and damage must be addressed quickly and thoroughly. 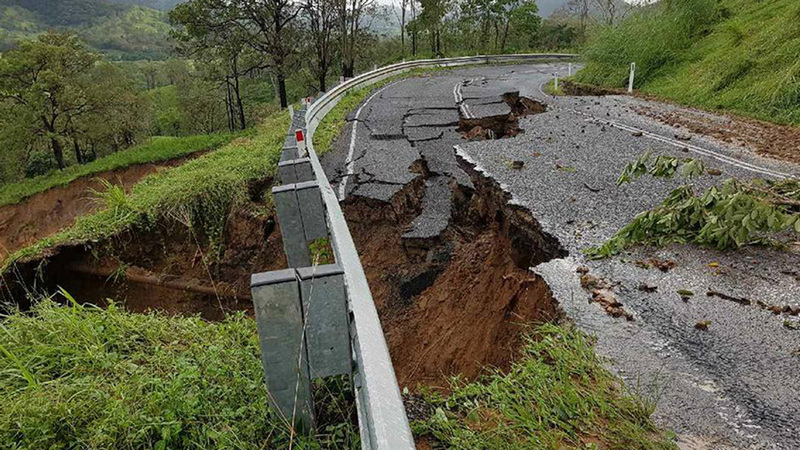 This year, the impacts of Ex-Tropical Cyclone Debbie (known as Ex-TC Debbie) challenged a large part of the state and many improvement projects were put in place to address known risk areas. Ex-TC Debbie crossed the Whitsunday coast as a Category 4 on 28 March 2017. The Mackay/Whitsunday district, including Hamilton and Daydream Islands, Airlie Beach, Proserpine, Bowen and Collinsville, received significant damage. About 2575 kilometres or 8 per cent of state-controlled roads (see glossary) were closed or had restricted access during the event. Five ports were affected, 97 vessels were stranded and 95 maritime aids to navigation (AtoN) were damaged or moved. Pavement surfaces, road shoulders and drainage infrastructure on many major roads and highways, including the Capricorn and Bruce Highways, were severely damaged and significant risks to motorists were caused by minor land slips and fallen power lines. severe flooding in Rockhampton, Isaac, Livingstone, Mackay, Whitsundays, Logan, Scenic Rim and the Gold Coast flooding of major cities including Ipswich, Caboolture and Brisbane. The high-level Bruce Highway bridges crossing the Yeppen Floodplain was tested for the first time in March 2017 when Ex-TC Debbie caused major flooding of the Fitzroy River and Yeppen Floodplain in Rockhampton. For a period of five days, all Bruce Highway traffic was diverted onto the high-level Yeppen South Bridges crossing the floodplain, maintaining connectivity for the Bruce Highway and overcoming the historic isolation of the Rockhampton community during natural disaster events. The $170 million projects primary objective was to minimise isolation during moderate and major flood events. It has set a new benchmark for local industry participation in Queensland, delivering a world-class outcome for the community, commuters and freight users. The Yeppen Floodplain bridge in central Queensland is the state's second longest bridge at 1.64 kilometres. Working from the State Disaster Coordination Centre (SDCC) at Kedron in Brisbane, Maritime Safety Queensland (MSQ) (see glossary) and Transport Network Security and Resilience staff liaised with all impacted regions. The team collected and disseminated information on the status of the transport network in partnership with our Disruptive Event Leadership Team, who coordinated operational activities and response across the business. Our staff worked as part of a whole-of-government Community Recovery 'Ready Reserve' team alongside a range of government and non-government agencies to provide services such as triage services, applying for financial assistance and logistics planning to assist the regions in managing community recovery operations. TMR's first priority was the safety of the people who use our road, rail and port networks. We swiftly initiated temporary repairs to have these essential transport links reopened as soon as possible. work with bus, coach, taxi, ferry and air service operators to move people to safety. TMR was represented by staff at the SDCC for 14 days during the preparation for and response to Ex Tropical Cyclone Debbie. Across that time 16 staff worked over 744 employee hours, providing over 51 updates to the SDCC to increase situational awareness. As the holder of vital information about the current situation across the state's road network, TMR responded to the catastrophic weather event by dramatically scaling up its presence on Facebook and Twitter (see glossary). The public demonstrated the value of this avenue of engagement as they accessed information across these channels in unprecedented numbers. In the days leading up to Ex-TC Debbie, we used social media to warn Queenslanders of the approaching weather event. Content on Facebook and Twitter shifted to reinforcing flood safety messaging and educating the public about driving conditions. Boat owners, skippers and operators were reminded of their Cyclone Contingency Plans and told to prepare for severe weather. The prevailing themes for this period were making smart decisions and looking out for one another. During the event, social media became a round-the-clock nexus for statewide emergency response information, QLDTraffic updates and communication received from staff and crowd-sourced from the public. Content posted on Facebook and Twitter shifted to critical safety alerts and up-to-date traffic and travel information. TMR social media was widely shared and cited as an authority by local councils, ABC Emergency, the Bureau of Meteorology, Queensland Police Service and Queensland Fire and Emergency Service. In turn, we shared other departments' content and ensured terminology and hashtags were consistent among departments. We responded to hundreds of individual requests for travel advice and heavily promoted QLDTraffic as a practical utility for Queenslanders. The heightened profile boosted the recently launched QLDTraffic's name recognition around the state and directly contributed to 137,577 referrals to the website from 24 to 31 March. Targeted paid promotion was used for the first time on TMR's Facebook page, ensuring information reached the people to whom it was most critical. By accurately predicting the audience's location and interests, TMR achieved exceptionally cost effective results – as little as three cents per post engagement. In the aftermath of the event, TMR used social media to highlight the department's recovery effort and the remarkable turnaround on important repairs to the network. Public comments during this period became noticeably more supportive and appreciative, marking a turning point in the prevailing sentiment toward the department that continues to this day. Our social media achieved strong results in the month following 24 March. During that 30-day period TMR Facebook posted or shared 94 times, achieved 3,828,469 reach and increased its followers by 28 per cent (10,874 people). TMR Twitter tweeted or retweeted 666 times, achieved approximately 239,000 reach and increased its followers by approximately five per cent (568 people). TMR's social media was a small part of the department's phenomenal response to Ex-TC Debbie, but it had an appreciable affect on a large number of Queenslanders and signalled that social media has an important role to play in the future of how TMR engages with the public, especially in times of crisis. The QLDTraffic app was downloaded about 30,000 times and the website had one million unique page views between 28 March and 2 April 2017. The Android app became the #1 trending navigational app in Australia on 30 March. As a part of the cyclone recovery phase, TMR's focus was on fully reopening the road network for safe operation and restoring other critical infrastructure and services. assisting TransLink (see glossary) and Queensland Rail Limited to ensure that passenger and freight transport services resumed as quickly as possible, allowing people and vital supplies to move around the state. Maritime Safety Queensland's well-established cyclone contingency plans slipped into gear prior to Ex-TC Debbie's arrival ensuring our ports and harbours, ships and boats were as well-prepared as possible to ride out the storm. The unpredictability of a cyclone's movements saw it cross the coast at Airlie Beach before swinging south after landfall and drenching virtually the entire central and south east Queensland coastlines. 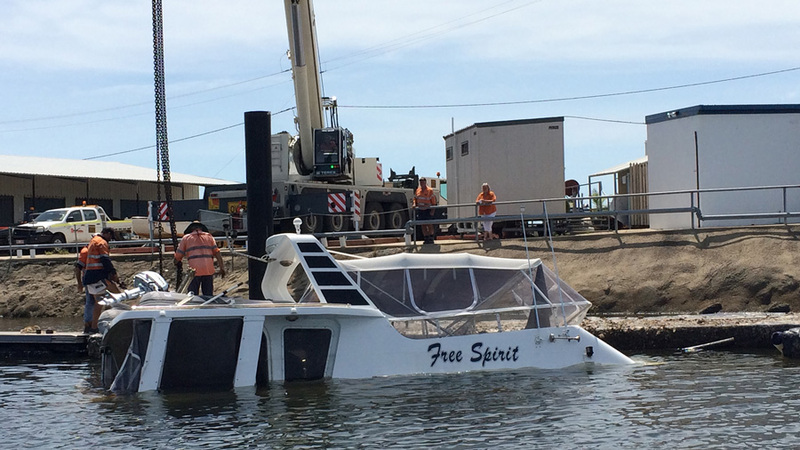 Ports from Townsville to the Gold Coast were affected, with shipping movements suspended. While smaller vessels and infrastructure suffered some damage, especially around the Whitsundays which took the brunt of the cyclonic winds, the ports, harbours and ships survived relatively unscathed. As soon as the cyclone had passed, our staff worked tirelessly to make essential repairs, including restoring radio communication and AtoNs to ensure maritime safety and support for the marine tourism sector in the area. It will be some time before all services are fully restored and all stranded vessels recovered. However, the well-established cyclone contingency plans certainly proved themselves. The flooding and cyclonic weather across Queensland during Ex-TC Debbie caused significant damage to our roads and infrastructure. 36 local government areas have been activated to receive funding through National Disaster Relief and Recovery Arrangements (NDRRA) (see glossary), a joint federal/ state government initiative to restore state government assets damaged by flooding. This is the biggest activation since Ex Tropical Cyclone Yasi. The state government's Queensland Reconstruction Authority released a two-year State Recovery Plan, called Operation Queensland Recovery. The plan will support communities affected by the impacts of the cyclone and provide the essential framework of the statewide recovery effort, including restoring essential infrastructure and functionality and economic recovery for local communities. Disaster repairs and long-term reconstruction works will be performed and completed by 30 June 2019.